3/10/17: Naomi Nachman interviews Esther and Johnny about Camp Shoshanim and Camp Nesher. They discuss the Susie Fishbein Culinary Institute and Naomi’s role in the Culinary Institute. 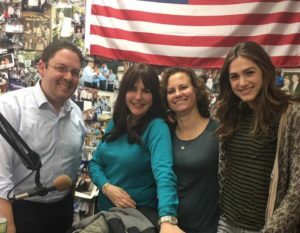 Esther Staum Katz (Director of Camp Shoshanim) and Johnny Shlagbaum (Assistant Director of Camp Nesher) were guests on Naomi Nachman’s “Table 4 Two” show on the Nachum Segal Network this morning.